Nikheel Gorolay was born in London to East African Asian parents. 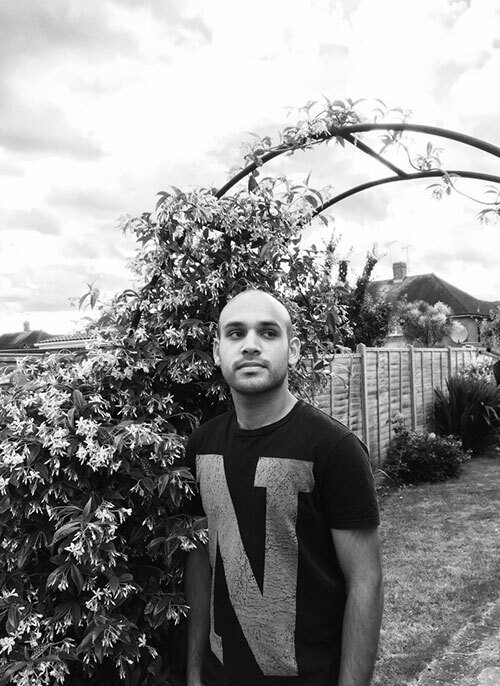 He has contributed poetry and book reviews to SABLE Litmag and has just completed his debut novel, Bricks and Mousa, which is inspired by his life as part of the British Asian community and growing up in a home which has been a regular building site over the years. He is a member of Inscribe, a development programme affiliated with Peepal Tree Press and aimed at writers of African and Asian descent. He is also currently studying for an MA in Intensive South Asian Studies at the School of Oriental and African Studies (SOAS), University of London. They were approaching the restaurant. Southall had not changed much since either of them had last visited. They used to come regularly to satisfy Rehan’s cravings for habshi halwa, those dark rectangles of sticky deliciousness made from a blend of milk, ghee and all manner of nuts and spices. A sweet fit for a king, until that king got diabetes and had to monitor his sugar intake. Rehan slowed the car down and craned his neck at a variety of angles. Rehan slammed on the brakes. There was a dull thump. A scruffy, skinny man had appeared in front of the car and come into contact with it. But he seemed unfazed and walked around to the driver’s window, which was open. He stuck his face close to it, so that Rehan could smell the booze on his breath. ‘Let’s get out of here,’ said Anisa. Her window was open too, and another head presented itself, bearing the face of another man. Rehan noticed something in the rear view mirror. The next car coming down the road looked familiar. ‘It’s Altaq,’ he said to Anisa. ‘I’m driving away. Push him out now.’ His words came out in one breath, all in Swahili. Anisa just looked at him. He pressed down hard on the accelerator and pushed the skinny man’s head out of the car. Anisa did the same on her side and the car lurched forward. Rehan threw the steering wheel round and pulled back out into the road. There was no traffic in the oncoming lane either, so he headed straight into the car park opposite the restaurant. He kept an eye on the rear view mirror as he eased the car over the hump at the entrance to the car park. It was definitely Altaq’s jeep, and it now seemed to be stopping exactly where they had been. The two men had disappeared. ‘Why is he stopping?’ asked Rehan, as he looked around for a spot to park in. Rehan settled on a space directly opposite the entrance, and with a full view of Altaq’s jeep. Anisa had a look and found it, along with a bottle labelled ‘Mixed Spice,’ though what it actually contained was cloves. She passed the cloth to him and picked out a few cloves. She popped them into her mouth and began sucking the flavour from them. Rehan breathed heavily onto his spectacles, then rubbed them with the cloth. He held them up to inspect the difference. There was some movement as the two men came back into view, emerging from the alleyway next to the restaurant. Altaq hooted at them. The two men looked at each other. Altaq hooted again, then wound down the window and shouted something at them. ‘Looks like he’s calling them over,’ said Rehan. ‘I thought you couldn’t see anything?’ asked Anisa. ‘I can hear though.’ He tapped on the window next to him and smiled. Anisa hadn’t realised that he had rolled it down slightly. ‘I can’t believe this sort of thing is going on in broad daylight,’ she said. Altaq was engaged in negotiations now, his head bobbing from side to side as he spoke to both men at once. They were indeed, climbing into the rear seats in the car, sliding across the smooth leather. Anisa could have sworn that one of them winked at her as they did so. Altaq fired the car back into life and pulled away from the kerb. He manoeuvred into a three-point turn, and decided to complete it at the mouth of the car park. ‘He’s coming this way. Quick, hide,’ said Rehan. He sunk into his seat, edging his plump backside forward in an effort to evade Altaq. But Anisa was a sitting duck, frozen in place as Altaq came into view. Her tongue hung out of her mouth, pink peppered with black. Altaq waved at her and she waved back. He laughed and reversed, turned the steering wheel, and drove away.